such as: painters, sculptors, industrial designers, everyday designers, chronicles etc. Date of birth / Place 0.4.06.1943 Education 1965 High School , 1965-1967 Free Werkschule ALMerz , Stuttgart . 1967-1970 studied graphics at the State . Academy of Fine Arts in Stuttgart. 1970-1971 Studies / Advertising Assistant at the advertisers School, Hamburg. Member Association of the German Designer day e.V. have been continuously resident in Berlin- Spandau since 1934 , was married to a busy clinician . The marriage sprang three now grown-up children , supplemented by five grandchildren. Yourself of professional kindergarten teacher and Hortnerin , not your dream job , would like to become an interior designer , what was denied from any cause whatever beyond her reasons her. The painting, a first also unfulfilled childhood dream ( an aunt on his mother's well-established painter ) , she was able to devote only after the children from the worst out and the family was settled down in his own house. She won in 1978 oil painting classes at the community college Spandau and pursued with academic seriousness , as designated one of its lecturers , their further training in oil, watercolor , drawing, pastel , experimental printing and other techniques , by extending over nearly three years in ten regular participation of international summer schools of the Free Art School Berlin and courses, seminars and workshops in Fischerhude , Schwarzburg , the folk high school Donndorf monastery , the folk high school Glienicke, Lehnin , Klosterheden , Berlin -Wedding. Your Instructors: Rolf barrels, Isa Herzog, Johanna Heyder , Michael Morgner , Helga Schulze, Linda Black, Frizzi room. The first exhibition was in 1991 possible in the "Gallery in the backyard " to Berlin -Spandau , Wilhelmstrasse. She was a complete success. The opening speech at the opening on 23.11.1991 held the Berlin painter Helga Anita Schulze : " Ladies and gentlemen , ladies and gentlemen, dear friends of the gallery Frank and the House Small, it is my distinct honor and pleasure to a woman but maybe not from this special page - - a woman whose Tagesblauf of social duties with all the joys and burdens is determined to be allowed , which is well known to many of you imagine . From this situation , also to have an equivalent , when children emerge gradually abandoned after his parents' house and some free space ( mental and temporal ) , Konstanze Klein began about 13 years ago with the painting. At the community college , she met Spandau many years with like-minded people in the study of colors in oil and watercolor . It created friendships and private painting groups thereof who set out on their days together to work. Seminars at the folk high school Glienicke and in Fischerhude well as the instructions of their teacher slowly let the emerging realization that an indispensable elixir of life had become of the initial pastime. And as just as is : the more you penetrate in a matter , the more you can feel the own shortcomings . How helpful can be the small impulses of professionals : ' Let it be the earnest coloring, - but let the colors flow ' Constance Klein often experienced with great astonishment . The miracle that something not be done previously existed before , filled her with deep joy . Your pictures are far from naturalistic Abmalerei so that they would not be satisfied . But what seems conjured up with such a light hand on sheet , has an intense past life . It means penetration of the shapes and colors with Sense and Sensibility . A successful watercolor painting has sometimes 3-4 precursor before the last then favor in her critical eye. But there are also those miraculous experiences that a walk is enough - and there are pictures as it were in one breath, full of gratitude and devotion to the creation - such as ' along the way ' , - ' Reed in November' and ' summer finale ' . Your work adheres to something superficial , all about Pleasing , they are truly experienced . And who could see her while painting once over his shoulder , completely playing with the colors given up or tough and fiercely struggling with the pitfalls of perspective, feels exactly : Here is a man at work who can no longer be of this passion, will not be satisfied with superficial , decorative shape bauble , but with a real flair for the artistic , with honesty and rigor creates a world to itself , are in joy and harmony at home . Our own reality needs such paradises - and we need such images as that of Constance Klein. Let yourself be captivated by the poetry of these images , and take some of the lights in on and with home. We thank Mrs. Constance Klein for this experience and wish her ​​and the whole family the best of luck ; and also thank Mr. and Mrs. Frank ( author's note : the gallery ) , which enabled with love and use this beautiful exhibition . " Of the 73 exhibits on display 31 were sold. It was followed by numerous own and joint exhibitions , often in the course and seminar places. Last drawn by serious illness, my wife has a 32 -year life painter an amazing development undergone by the first almost purely representational of a gradual dissolution of strict forms until finally towards total abstraction . Only recently has the considered legacy of the painter , surprised by this development, paid high praise to an expert connoisseur. To view the selected images please press the switch gallery below in the toolbar on the left of the screen or in the switch table immediately below this text. 17 June to 17 August 2012: Exhibition at the Art Gallery Prince , Berlin- Hohengatow , Kladower dam . January 24, 2013 : Today was opening an exhibition of the painter in Spandau, in the Gothic House . It lasts until March 16, 2013, and is open Monday to Saturday each 10-18 clock . Admission free . For video of the vernissage : www.spandautv.de -> Constance Small - click retrospectively . SPANDAU - How it lights up: Even the clouded gray of the local sky was at its color to purple or brown. With evocative landscapes and sensual floral still life Konstanze Klein is presented in the Gothic House in Spandau currently . One died in 2010, to artist, who dreamed since childhood of it paint. But it lacked the 1933 -born doctor's wife at the time , until the late 1970s, she began to try technology and materials. The exhibition provides the full range of her work , there is a resulting 1980 Havel view , include the term " my first watercolor attempt ." Again and again she returned to the bank of the Havel , watching sailing boats in the tender aufgleißenden morning light. The reeds in the wind, strong unreal sunset over the water. Her work is beautiful, yes, that one may say , because they are of a stimulating color harmony. This is especially true for the flower paintings , the early - still running in meticulous accuracy - "Roses from my garden ." Later happy dissolved in a fascinating color carpet. Two 2004 works, including " winter grass in the spring sunshine " and " wilted grass from winter," are mainly structural and light. Here, the brown has become dull and moisture grass , where the musty , still hung with snow remains. At that time verfertigte Constance Klein also acting abstract gradient experiments. At least they look very physically and informally at first glance . But then shows up , these are the resolved structures of different tree bark . Other , really abstract color spot combinations they had provided with verses : "I am an adult or child? " She wondered as , touched by the delicate play of the wind in ripe ears . This joy in the little things , the everyday wonders of nature so transported Konstanze small in all the images presented now . It has carried out times as watercolor , sometimes as pastel , every now and then in oil, but also with acrylics. Some during trips , the Mediterranean , or just in the marrow, in Lehnin or Klosterheden . But the most beautiful stay those pictures that have emerged virtually at their doorstep in and around Spandau . The exhibition of works by Constance Klein is on view until March 16, the Gothic House in Spandau , Breite Straße 32 . It is open Monday to Saturday, 10 to 18 clock . The photo comes from the Chronicle 75.Jahre Gebr Friedlander. A business enterprise that has remained a century of life like , everywhere and always be celebrated. To exist in Berlin , however, and in the period 1829-1929 to preserve the tradition in four generations of a family : this is admired almost like a miracle. Berlin has come in that time another way than any other city . The neubegierige Berlin was in itself by no means inclined to get a firm in confidence. It was necessary to remain upright on shaky ground . What changes , political , economic and social shocks and twists of taste in this century ! The resistance of the house is based on forces and properties that may be nachgerühmt of the moderns on memorial days the ancestors and fathers. After a solid foundation of trust had acquired , and was never allowed to be abused. Organic, conformably , the company grew with the city , made westwärs safe and cautious steps , settled up borne by the general upswing and, what was more difficult , not bring in bad fall. The history of the company Gebr Friedlander is closely linked to the Friedlander family who at all times took a lively interest in the skill of the house. On March 30, opened in 1929, the then 28 year old ZL Friedlander Berlin at home Schlossplatz 13 in the Long , the present Elector bridge , a gold and silver business. The study of precious metals was home for generations in the family. Already in the first third of the eighteenth century worked at the Berlin engraver ZL Friedlander . This was appointed by King Friedrich Wilhelm I to the Mint , " Enoch walked well advised several Stampiglien (stamp) to our satisfaction and have ausgeführet Feynman " . His position as Münzwardein practiced ZL Friedlander also under Frederick the Great from . There are several coins from the time of Frederick the Great received that have been marked with his stamp . He died at an old age in a prestigious position. 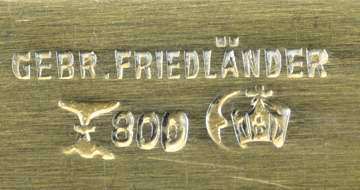 A grandson of Münzwardeins was ZL Friedlander , founder of the company Friedlander . At the Mint : The Münzwardein examined the coins on their fineness of used metals or alloys. He was also responsible for control of the mint master , the stamping goods and their quality as well as the alloy and weight. The Münzwardein was commissioned by the Coin Lords and thus in an official capacity at the fineness control of precious metal and precious metal goods in trade . He established Münzgewichte and was in still minting a mint often depositary of embossed iron. For the work of Münzwardeine already existed in the 16th century accurate tasting regulations and laws . The first tasting rules were created by the Münzguardein Lazarus Ercker and were regarded as the standard work of the metal analysis in the 16th century. Your measuring tools, such as the analytical balance , developed and built the Münzwardeine mostly himself . These scales had to be so precise that even the accuracy of the best Augsburg or Nuremberg for the weighing process was not sufficient . Since the supervision of the coinage in the kingdom was in accordance with the imperial coinage in the Empire of Maximilian I created circles , the Ward One of these circles were also called circle Ward One or Kreismünzwardeine . The company was founded in 1938 to Kurt Hermann , who was a customer and friend of Hermann Göring and so could level the Jews to emigrate to London. Poznan 12.26.1839 - 10.30.1893 Berlin chemist, D. Study of Chemistry at the Royal. Commercial Academy in Berlin. Conn.. Director of a chemical company in Neuwied. 1868: PhD in Rostock (Dr. phil.). Active in Sweden. From 1869 he is concerned in Berlin with the exploration of ceramic technologies; is that laboratory staff of the "German pottery and Ziegler-Zeitung" and takes over after the death of the publisher from 1871 Radaktion the newspaper. 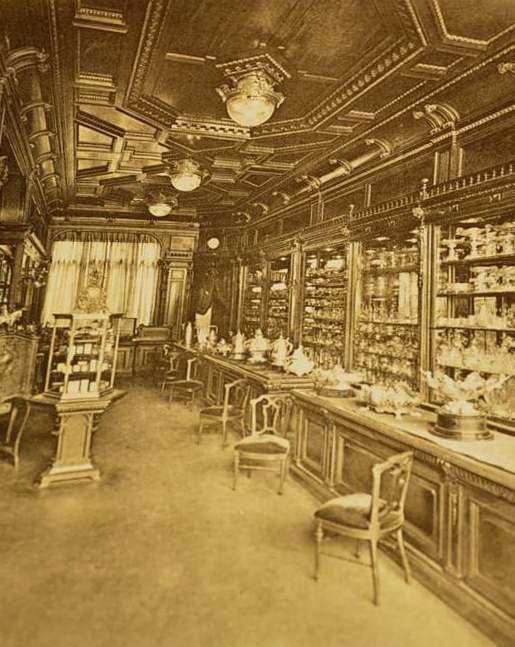 1876: Creation of a research laboratory of Ceramics in Berlin. Editor of the "clay industry newspaper". Lecturer at the Royal. Commercial Academy. 1878-1890: Head of the newly Chemical-Technical Research Institute of the Royal Porcelain Manufactory, Berlin. 1884: Exhibition in Berlin Applied Arts Museum, vessels with oxblood glaze. Development of the "Seger cone" (for temperature measurement and control of the combustion curve) and 1880 of the "Seger porcelain" (soft-paste porcelain). Decisive influence on the development of KPM, Berlin and the postage. Ceramic industry. Ornamental bowl from Seger porcelain, click here for the offer. Bigot, Alexandre - Mer (Loire-et-Cher), born 05.11.1862 - 11.41927 / Mer - potters, chemists, F. physics and chemistry studies (PhD). 1889; Encounter with East Asian ceramics. Around 1892: founding his own workshop in Mer (Loire-et-Cher). 1894: First exhibition of his work in Paris. In 1897 the company was transformed into AG. 1900: participation at the World Exhibition in Paris with animal frieze (Grand Prix); later opened a studio in Paris. 1914: resolution of the company (financial difficulties). Art objects, vases, statues, architectural ceramics (glazed stoneware). Numerous exhibitions at home and abroad. Collaboration with the artists include: Van de Velde, Henry Clemens, Guimard, Hector, Roche, Pierre (1855-1922), Jouve P.; Sauvage, Henri (1873-1923), Majorelle, L; Bourdelle; Fix-Masseau, Pierre-Félix; Charpentier, Alexandre, Halou, Alfred-Jean (1875-1939), man Evile, and André de L'Art Nouveau Bing, Paris. Bibliography (source): ceramic brands lexicon porcelain and ceramics Report 1885-1935 Europe (mainland) page 397 / 2-44. Tapio Wirkala: Finnish graphic designer and interior designer. 1933-36 Studies at the School of Applied Arts in Helsinki (sculpture). 1946 Award of his sculptures for the glass factory Kurhula-Iittala. 1951 Grand Prix for the Finnish pavilion at the Milan Triennial. 1951-54 Artistic Director of the School of Applied Arts Helsinki. 1955-56 staff in the design office of R. Loewy in New York. Designs especially for glass, but also for lamps, cutlery and for Steingutfabrik Arabia in Helsinki. 1971 Honorary Doctor of the Royal College of Art in London. Numerous international awards. Since 1956 freelancer for the Rosenthal: Designs for service and object of the limited art edition >> << the Studio line; numerous designs for vases and bowls in porcelain and Porcelain >> << noire; also for cutlery, drinking glasses, glass vases and ceramics; Annual plate 1971; receives 1963 in Faenza for the gold for the service form >> << Composition and the United States the International Design Award of the American Institute of Interior Designers of interiors for the service and cutlery form >> << variation (source: Rosenthal). BJØRN WIINBLAD (The * 1918 † 2006) was born in 1918 in Copenhagen. He studied at the Royal Academy of Art in Copenhagen in Jörgensen painting and illustration. During this time he discovered his love for ceramics. Since 1946 he worked for the faience "Nymölle" In 1952, he built his own workshop. Bjorn Wiinblad was inspired by music, theater and the world of fairy tales. Again and again he found new areas with which he grappled. He designed, among other ceramics in various techniques, posters and post-cards, theater and ballet productions, but also bronzes, tapestries and furniture such as fabrics and wallpapers. Since 1957, Bjørn Wiinblad has worked as a freelance designer for Rosenthal. He has emphasized the imaginative part of the Rosenthal Studio-Line decisively influenced by a variety of service types and gift items. Works by Björn Wiinblad shown in numerous museums and exhibitions. He lived and worked in his "Blue House" near Copenhagen. " Bjorn Wiinblad is one of the most imaginative designers of our time. His stage designs and his ceramics brought him worldwide recognition. His cheerful colorful images and patterns with their fairy-tale characters are distinctive. The Danish Queen appointed Bjorn Wiinblad for his services to honor artisans. In the series "Aladin" is a favorite subject Wiinblad reflects: the illustration. Here he talks to small decorative plates the history of the fairy tale character Aladdin from 1001. Each of these dishes is carefully decorated in rich colors on an intense cobalt blue. The precious gold ornaments underline the effect of Wiinblad fairytale illustration. Premio Internazionale (1961 "Tulipa" Designer Selection (1967) "Lotus"
The good industrial design - iF (1967) "Lotus" Medaglia d'Oro coffee service (1967) "Lotus"
The good industrial design - iF (1970) "Composition cobalt bloom"
Design Choice (1976) "form with no name"
Medaglia d'Oro (1976) "form with no name"
Portrait of the designer: "BJØRN WIINBLAD (The * 1918 † 2006) was born in 1918 in Copenhagen, he studied at the Royal Academy of Art in Copenhagen in Jörgensen painting and illustration During this time he discovered his love for ceramics since 1946, he was working for... faience "Nymölle" In 1952, he built his own workshop. Björn Wiinblad was inspired by music, theater and the world of fairy tales. Again and again he found new areas with which he grappled. He designed, among other ceramics in various techniques, posters and post-cards, theater -..., and ballet productions, but also bronzes, tapestries and furniture such as fabrics and wallpapers Since 1957 Bjørn Wiinblad has worked as a freelance designer for Rosenthal Through a variety of service types and gifts has the imaginative stressed part of the Rosenthal Studio-Line decisively influenced works of Bjorn Wiinblad shown in numerous museums and exhibitions. He lived and worked in his "Blue House" near Copenhagen. "Rosenthal portrait of the designer: Richard Latham is one of the leading American designers of the 20th century he was a student of Mies van der Rohe and worked for Raymond Loewy in 1955 he set out as a partner of the design offices Latham / Tyler / Jensen independently and counted to.. its customers, among other things Ampex, Bang & Olufsen, Xerox. For Rosenthal Latham has been working since 1954. designing for Rosenthal studio-line Loewy and he the classic> 2000 <(china and cutlery) and the> form E <and the glass series> Composition < and 'LOTUS'. Click here for all articles of Wiinbland, Björn has the KuSeRa on offer. Gerd A. Müller (* 1932 in Frankfurt am Main, † 1991) was a German industrial designer. Müller was particularly known for his designs for the pen manufacturer Lamy and Brown (electrical appliances). After vocational training Müller studied from 1952 at the Art School in Wiesbaden. After graduating as an interior designer, he was one of the first designers hired by Braun. For Braunmüller designed various kitchen appliances. Became known for the he designed razor SM3 and the kitchen appliance BM 3 / 31st From 1960 he worked as a freelance designer. He designed for Lamy fountain pen in 2000, where he until then in the writing instruments segment unknown material Makrolon (characterized by high strength, impact resistance, stiffness and hardness) used. The pen became a classic of modern design and a worldwide success. He also designed the Lamy st (reduced and elegant). 1934 took over Bollhagen together with Heinrich shield which also shut down in the wake of the economic crisis Haël-work activities for Artistic Ceramics in Brandenburg Marwitz and founded the HB-workshops for ceramics, especially small industrially produced tableware according to artistic designs, garden ceramics and advanced structural ceramics (eg for the Berlin Red City Hall) established; single pieces made by Hedwig Bollhagen supplemented the offer ..... 1939, Hedwig Bollhagen with a painted by Charles Crodel vessel, the master examination. End of the Second World War moved Heinrich plate 1946 from the former Soviet occupation zone to West Germany to. Hedwig Bollhagen then took over the leadership of the HB-workshops under our sole responsibility. 1972 Werkt sites were nationalized, but remained Bollhagen also in the twenty years up to the re-privatization in 1992 the artistic director and worked until shortly before her death on. Gained international recognition Hedwig Bollhagen have a simple, timeless everyday dishes, which in shape and decoration succeed in a casual combination of rural tradition and Bauhaus aesthetic. She herself said: "Art? Oh yes, some call it so. I make plates, cups and jugs. "Or shorter. "They are merely Töppe!" Died in 2001 Hedwig Bollhagen Marwitz. Richard Latham is one of the leading American designers of the 20th century. He was a student of Mies van der Rohe and worked for Raymond Loewy. In 1955 he went as a partner of the design offices Latham / Tyler / Jensen independently and counted among its customers, among other things Ampex, Bang & Olufsen, Xerox. For Rosenthal Latham has been working since 1954. Designing for Rosenthal studio-line Loewy and he the classic> 2000 <(china and cutlery) and the> form E <and the glass series> Composition 'and' LOTUS '. " Between 1946 and 1948, Achtziger in Munich studied at the construction and craftsmen school (with Hans Panzer). In 1959, he went back to Hutschenreuther, where he created several popular tableware, such as such as "Princess" tea service "710", "Poetry", "Renezvous" others, and 150 porcelain figurines. Ruth Gurvich: Ruth Gurvich was born in 1961 in Cordoba, Argentina. In her home country she studied architecture. In 1979 she joined the liberal arts and continued her studies from 1987 to 1991 in Paris at the École Nationale Supérieure des Beaux-Arts continues. In her designs, Ruth Gurvich want to show the shapes and structures of everyday things as they are. Your understanding of design is defined globally, but is firmly rooted in the tradition of the local. She became known for her three-dimensional works made ​​of paper, which are a very unique filigree aesthetics on the track. She sits in her designs aware of the materiality of the paper - a material which allows light, motion and vibrancy to get into things. The first German word that learned the designer was "paper". Ruth Gurvich lives and works in Paris. Ferrari, Gaetano, images Hauer from the Canovaschule, son of Giovanni F. (gen. Torretti), active in Venice in 1847 and still alive. Students by Rinaldo Rinaldi. Customized according to the draft of 1826, the marble bust Moschini's Seminario in the church of S. Maria d Salute in Venice. Furthermore, by him the Lion of St. Mark (in bronze executed) on the outside above the main windows of the facade of San Marco in Venice. 1820 F. was on the Kunstausst. das. nymph with 3 heads and a relief of the head of Christ represented the crown of thorns. (Nagler, Kstlerlex IV 293 -. [Correr e altri,] Venezia e le sue lagoon, 1847 II 2 p 26 -. Moschini, etc. Chiesa di S. Maria della Salute, 1842 - Kstblatt, 1820 p 342. Raymont Loewy (* 1893, † 1986): Raymond Loewy applies in the U.S. as the father of American industrial design. Loewy, Raymond American designer. French origin. Designs already as a 15 year old game prämiiertes aircraft. Training as an engineer in France. First Fashion Illustration for Harper's Bazaar >>. >> 1919 moved to New York City. Fashion Illustrator at Vogue Magazine >>. << Since 1929 working as Designers. 1937 acquisition of American citizenship. Co-founder and president of the American Society of Industrial Design. Member of the French National Commission for industrial design. Chairman of Raymond Loewy International, London-Paris-Friebourg. 1951-55 Freelance his design office at the company Rosenthal. Bosse, Walter *13. November 1904, † 13. Dezember 1979 was a Viennese artist, ceramist, potter, metalworker, and craftsman noted for his modernist bronze animal figurines and grotesques. Walter Bosse attended the Wiener Kunstgewerbeschule (Vienna School of Applied Arts) from 1918 to 1921, where he studied ceramics under Michael Powolny, and ornament under Franz Cizek. He then attended the Münchner Kunstgewerbeschule (Munich School of Applied Arts). Durin his schooling he was given the opportunity to sell his work at the Wiender Werkstätte by Josef Hoffmann, who became a mentor to Bosse. Bosse opened his own shop in Kufstein in 1923. Bosse´s work grew in popularity and a number of his pieces were shown at the International Exposition of Modern Industrial and Decorative Arts in 1925. He started designing for Augarten Porcelain Works (1924) as well as Goldscheider (1926) and Metzler and Ortloff (1927). In 1931, to meet increasing demand (especially in America), Bosse opened up a bigger shop in Kufstein, but by 19833 he started to feel the effects of the economic depression. By 1937, the Kufstein works were closed. In 1938, now divorced, Bosse moved back to Vienna where he founded Bosse-Keramik (Bosse-Ceramics), which expanded under the new name “Terra” on include glass, toys, textieles and variety of craft items for the gift market. In the late 1940s, Bosse began experimenting with brass by giving his ceramic figures a metal coating to protect them from brekage. In the early 1950s, Bosse began his “Black Golden” line of brass figurines. He transitioned all of his efforts to brass. The figures became popular worldwide.